Personality: stonefish are rather unpleasant-looking fish up to 50cm in length. They are found in shallow waters around coral reefs, where they camouflage themselves as ugly bits of rock or old coral, or bury themselves in the sand. They can survive for up to 24 hours out of water and are sometimes found on beaches. These locations are unfortunately perfect for guaranteeing they will occasionally be trodden on by unsuspecting beachgoers, swimmers and divers. They feed on small fish and crustaceans, and are in turn eaten by rays, sharks, sea snakes and possibly Aboriginal folks. Hyaluronidase – an enzyme which degrades connective tissue. Stonustoxin – causes nitric oxide-mediated vasodilation and profound, irreversible hypotension; increases vascular permeability to cause oedema; and forms pores in cell membranes, resulting in cytolysis, haemolytic anaemia and neurotoxicity. Verrucotoxin – interferes with cardiac calcium and potassium channels, putting the patient at risk of lethal arrythmias. Trachynilysin – an excitatory neurotoxin with haemolytic effects. Weapons: they keep their venom glands in a series of thirteen sharp erectile spines running down their backs, which they raise if they feel threatened – they’re not the sort to run and hide. These spines can easily penetrate human skin if the stonefish is stepped on or handled by curious divers, and subsequently inject venom into muscle tissue. Clinical features: the main feature of a stonefish sting is absolute agony. This starts immediately and radiates centripetally from the puncture wounds, which become tender and swollen with bruising or bluish discolouration. Symptoms of significant envenomation include dizziness, delirium, nausea, hypotension, collapse, cyanosis, pulmonary oedema, weakness and paralysis: these require urgent medical attention as massive envenomation can kill in 2 hours. Management: get the patient out of the water and remove any broken fragments of spine using tweezers or forceps. DO NOT APPLY A TOURNIQUET OR PRESSURE BANDAGE. Some sources say that immersing the affected limb in HOT WATER (>45°C) may help to reduce the pain. IV analgesia or local/regional anaesthesia are often required. Tetanus prophylaxis may be appropriate depending on the patient’s vaccination status. Antivenom should be given intramuscularly if there are any signs of significant envenomation. Stonefish antivenom is the second most commonly used antivenom in Australia, and since its introduction in 1959 has successfully prevented any deaths. Personality: box jellyfish (also known as sea wasps) are large, with cube-shaped bodies and about 15 tentacles, each up to 3 metres long. They are one of the few types of jellyfish to possess proper eyes – which are grouped in clusters around their bodies – but scientists are unsure how they actually manage to process visual information, as they don’t have brains! They are mainly found in the tropical waters of northern Australia and the South Pacific, particularly drifting around shallow waters or washed up on beaches. They tend to avoid contact with humans, so stings usually only occur if humans accidentally brush up against jellyfish in the water (they are practically invisible) or step on them. Venom: good samples are very difficult to obtain, so our understanding of the toxins involved is rather sketchy. It contains a potent and fast-acting primary cardiotoxin, some myotoxic components, and probably some necrotoxins as well. Weapons: box jellyfish tentacles contain millions of individual stinging cells called nematocysts, which use a tiny needle-like shaft to inject venom directly into capillaries under the skin. Nematocysts also help the jellyfish to cling tightly to its prey and restrain it while venom is injected. Clinical features: the first feature of a sting is excruciating pain – victims are at risk of drowning before they are able to get back to land. The nematocysts adhere tightly to the skin, and any attempts to remove them only make the pain worse by causing even more venom to be released. Horrific red welts appear almost instantly on all affected areas – these can later become blistered, necrotic and scarred. If significant envenomation occurs (generally >10% of skin surface) the patient will progress within 4-6 minutes from agonised delirium to respiratory collapse, serious arrhythmias and cardiac arrest. Management: get the patient out of the water. DO NOT TOUCH THE STING. Douse the entire affected area with as much VINEGAR as possible for at least 30 seconds – this inactivates the nematocysts, allowing them to be removed safely with a gloved hand. Give oxygen if available. Monitor closely for any deterioration in cardiac function, and commence CPR in the event of cardiac arrest. Cold ice packs may be applied to relieve pain. Significant envenomations should be treated with IV or IM antivenom as soon as possible, to reduce pain and the potential for skin necrosis. The value of antivenom in correcting cardiotoxicity is less certain, and patients may require prolonged cardiopulmonary resuscitation in hospital before they begin to stabilise. Personality: Irukandji jellyfish have absolutely tiny bodies 3-10mm long and virtually invisible to the naked eye, but their four tentacles can measure over a metre in length! Very little is understood about their life cycle and behaviour, as they are difficult to see, difficult to catch and extremely fragile. They mainly inhabit the deeper waters around northern Australia, but have been found as far afield as Japan, Britain and Florida. Venom: most probably contains excitatory neurotoxins which affect the closure of voltage-gated sodium channels, resulting in continuous acetylcholine release and massive overstimulation of motor and autonomic nerves. Excessive catecholamine release is a key feature. Weapons: unlike most jellyfish, Irukandji have nematocysts on their bodies as well as their tentacles, allowing them to sting their victims more effectively on contact. They also differ in that after being deposited their nematocysts only release venom from their tips, rather than from their whole surface. This explains the delay in development of pain. Clinical features: Irukandji syndrome has a characteristic progression of symptoms. The sting itself is only mildly irritating with no obvious marks, except for some goosebumps on affected areas. Development of major symptoms is delayed by about 30 minutes. Patients will then begin to experience severe discomfort in the form of headaches, backache, myalgia, chest and abdominal pain. Other features include nausea and vomiting, sweating, a profound sense of impending doom, arrhythmias, malignant hypertension, heart failure and pulmonary oedema. The pain is so unbearable, and the overwhelming belief they are going to die is so great, that patients have been known to ask their doctors to kill them just to get it over with. Symptoms begin to wind down after about 24 hours, but can take up to two weeks to resolve completely. Management: get the patient out of the water. DO NOT TOUCH THE STING. The entire affected area should be doused with as much VINEGAR as possible for at least 30 seconds, and inactivated nematocysts subsequently removed with a gloved hand. Monitor for deteriorations in cardiorespiratory function and provide appropriate first aid. There is no antidote to Irukandji venom, so treatment is mainly supportive and consists of effective analgesia with IV opioids, control of hypertension with short-acting drugs like magnesium sulphate, and early detection and management of pulmonary oedema. There have been 2 recorded deaths from Irukandji syndrome, both occurring before its aetiology, symptoms and management were properly understood. Personality: yes, that’s right, even in the oceans you can’t escape Australia’s deadly snakes! Sea snakes are almost totally adapted to living underwater – most of them cannot even move on land – but they do not have gills and must therefore surface regularly to breathe. Some can respire to some extent through their skin, allowing longer and deeper dives. There are 31 different species of sea snake in Australia, all of which are potentially dangerous to humans. However, while they may be inquisitive they are not normally aggressive unless frightened or caught. Bites to humans are rare and there have been no recorded deaths. Venom: contains postsynaptic neurotoxins and myotoxins. Depending on the species, the LD50 may be as low as 0.04mg/kg. The neurotoxin competitively binds to nicotinic acetylcholine receptors at the neuromuscular junction to induce neuromuscular blockade and flaccid paralysis. The myotoxins cause severe rhabdomyolysis, which ultimately leads to acute renal failure, hyperkalaemia and cardiac arrest. Weapons: sea snake fangs are small (<4mm) and fragile, often breaking off and remaining stuck in their victim’s flesh. However, localised pain is absent or minimal. Close examination will reveal small, distinct puncture marks at the bite site with little or no surrounding swelling. Significant envenomation occurs in less than 20% of cases. Clinical features: after experiencing early symptoms of systemic envenoming, patients progress within 1-3 hours to generalised myalgia and stiffness as their muscle tissue begins to break down. Trismus may also be a feature. Neurotoxic effects take slightly longer to appear (5-6 hours) and include ptosis, ophthalmoplegia, muscle weakness and paralysis. Within 12 hours of the bite you can expect to see frank myoglobinuria, acute renal impairment and hyperkalaemia. Management: as for snake bites. Get the patient out of the water and immobilise them before identifying the bite wound and dressing it with a pressure bandage. DO NOT APPLY A TOURNIQUET. Monitor closely for signs of airway compromise or respiratory paralysis and provide artificial respiration if required. If there are any signs of significant envenomation (i.e. paralysis or myolysis) sea snake antivenom should be given intravenously. If sea snake antivenom is not available, tiger snake or polyvalent antivenoms can be used instead. Personality: the blue-ringed octopus is undeniably a pretty little beastie. However, before you rejoice at seeing one looking lovely in the wild just remember that it only turns its blue rings on when it feels angry or threatened! When the octopus feels peaceful or happy it is a rather boring browny-yellow colour. They are only small – starting life the size of a pea and growing to the size of a golf ball – and live in tidal rock pools and shallow waters, where they tend to get trodden on, poked or handled by children and excitable tourists. Males die immediately after mating, leaving females to incubate their eggs in their arms for six solid months without food or rest and die once their offspring have hatched. Venom: each tiny octopus carries enough venom to kill 10 men, which is produced by bacteria living symbiotically in its salivary glands. The toxin was originally known as maculotoxin, but was more recently discovered to be identical to tetrodotoxin – the deadly substance found in blowfish venom. Tetrodotoxin is a potent presynaptic neurotoxin with an LD50 of 0.3mg/kg. It acts by binding to fast voltage-gated sodium channels, thereby blocking the propagation and conduction of peripheral nerve impulses. This results in rapidly progressive flaccid paralysis. 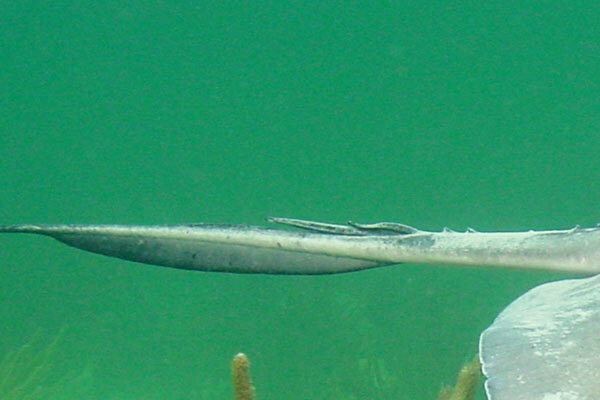 Weapons: its beak may be small, but it is sharp and powerful enough to penetrate a wetsuit. Bites are usually painless, so patients often have no idea they have been bitten until terrifying paralysis starts to set in. Clinical features: early symptoms may include weakness, numbness, perioral tingling and paraesthesiae. Complete paralysis can occur within minutes of a bite, with no impairment of conscious level or awareness. Pupils become fixed and dilated. If respiratory paralysis is allowed to progress, it results in cyanosis, hypotension, cerebral hypoxia and cardiac arrest. There may also be symptoms of systemic envenomation, including nausea and vomiting, diarrhoea, epigastric pain and headache. Management: get the patient out of the water. Treat as a snake bite: immobilise the patient and apply a pressure bandage to the wound if it is identifiable. DO NOT APPLY A TOURNIQUET. Protect the airway (there is significant risk of aspiration of vomitus) and provide mouth-to-mouth or bag-and-mask respiration as required. Remember that the patient is AWAKE and can see and hear everything that is going on around them. Blue-ringed octopus venom has no known antidote, so the only way to tackle its effects is to provide supportive treatment and mechanical ventilation until it wears off – this takes about 24 hours. Personality: stingrays can be over a metre long, and they live buried in the sand on the sea bed to conceal themselves from prey. They are extremely placid and usually allow snorkellers and scuba divers to swim alongside them. Attacks involving humans are rare – usually occurring when an unsuspecting stingray is stepped on – with only 2 deaths ever reported in Australia. It’s horribly ironic that Steve Irwin, a man who spent his life annoying Australia’s most vicious and deadly creatures, ended up being killed by something as innocuous and friendly as a stingray! Venom: not particularly deadly. It contains a mixture of hyaluronidase, proteases, cardiotoxins, respiratory depressants and convulsants. Weapons: stingrays have one or more barbed stings on their tails, which are sharp, serrated and coated with venom. These stingers can be up to 35cm long, and when wielded with a slicing or stabbing motion they can cause serious injuries to skin and underlying structures, especially if internal organs or major blood vessels are penetrated. Clinical features: the main problem is usually the result of mechanical injury by the stinger; lacerations and stab wounds may cause profuse bleeding and, depending on their location, damage to internal structures such as bowel, liver, heart, lungs and vasculature. The sting itself causes intense pain with local swelling, erythema and itch. Systemic symptoms include nausea, vomiting, abdominal pain, palpitations, collapse, headache, muscle cramps and fasciculations. Massive envenomations may result in hypotension, arrythmias, paralysis and convulsions, but even if these do occur, death is virtually always due to coexisting trauma. Management: get the patient out of the water and remove any broken stinger fragments. STINGS TO THE NECK, CHEST OR ABDOMEN SHOULD BE LEFT UNTOUCHED. Staunch any bleeding with local pressure, bandaging and tourniquets (if severe). Again, immersion in HOT WATER (>45°C) may help control pain. Don’t forget to check the patient’s tetanus vaccination status. Surgical interventions may be required to control bleeding, repair damage to anatomical structures or remove deeply embedded stinger fragments. The injury may be complicated by wound infections, ulceration or tissue necrosis. Personality: these legendary creatures have been terrorising the oceans since the dinosaurs were around. They can grow to 5m in length and weigh over a ton, although every now and again there are reports of monster sharks that are much larger still. They are apex predators (i.e. 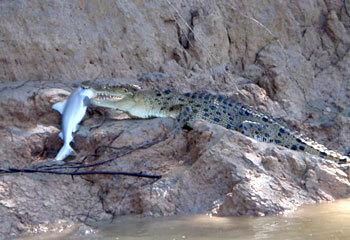 the top of the food chain) with little to no fear of any creature they come into contact with. They are curious animals, and like to explore anything new or unusual they encounter in their territories: unfortunately without hands or feet the only way they can investigate new things is by taking “exploratory bites” with their teeth! Their sense of smell is so keen it can famously detect the presence of a single drop of blood in an Olympic swimming pool. Additionally, like all sharks, they have sensory organs – known as the Ampullae of Lorenzini – which allow them to detect the electromagnetic field generated by the heartbeats and movements of living animals: these are sensitive enough to detect half a billionth of a volt of electricity. This “sixth sense” is known as electroreception. Venom: does it look like it needs any? 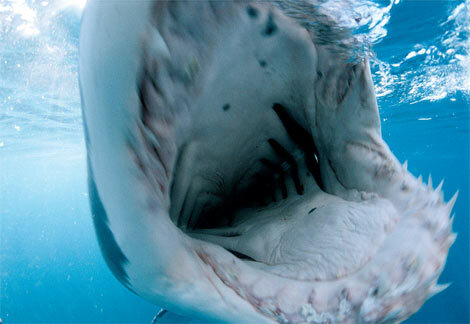 Weapons: great white sharks have hundreds of serrated triangular teeth arranged in several rows. Contrary to their depiction in the media as frenzied killing machines, they are actually subtle, cautious hunters which prefer to strategically stalk their prey from below before striking with devastating speed and force. After inflicting one or two swift bites, they retreat and wait for blood loss to weaken their victims before coming back to feed. 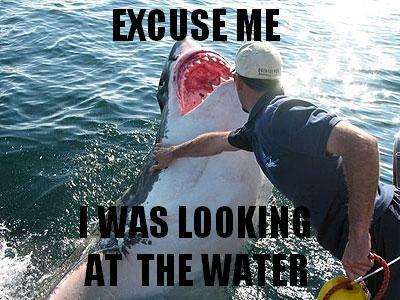 Attacks on humans may be provoked or unprovoked: there are several patterns of unprovoked attack including “hit and run” and “bump and bite“, which are two ways of curious sharks giving humans an exploratory bite to see what they taste like; and “sneak“, where sharks mistake humans for prey and move in for the kill – this is the most vicious and the most commonly fatal. In most cases the victim does not see the shark coming. 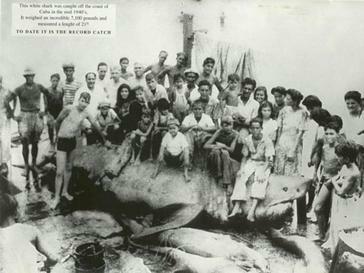 Clinical features: a shark attack can result in several characteristic injuries: a ragged crescent-shaped bite mark from being enclosed in its jaws, a series of deep parallel cuts from the teeth raking through skin, the removal of small to large chunks of flesh, and traumatic amputations of limbs. If the victim was involved in a “bump and bite” attack they may also have abrasions caused by the shark’s sandpapery skin rubbing against them. The violence and force of attacks can fracture bones. Blood loss and exsanguination is the most common cause of death. Management: get the patient out of the water as soon as it is safe to do so. Try to keep them warm. Manage bleeding as an absolute priority: if injuries are severe, death from haemorrhagic shock can occur within minutes. Lost limbs should be retrieved if possible and brought with the patient to hospital for assessment of viability. The main objectives of hospital management are control of bleeding, reattachment of tissue that remains viable, and prevention of wound infections with wash-outs and antibiotic prophylaxis. There are 10-20 shark attacks every year in Australia, and at least one of these is fatal. Personality: the saltwater crocodile is the world’s largest reptile, growing to lengths of 6 metres and weighing in at up to 1300kg. It is not technically a sea creature as it is most commonly found living in swamps, rivers and estuaries across northern Australia – swimming in these places is definitely not worth the risk! Another apex predator, it can eat virtually any animal that strays into its territory, including things like cows, horses and water buffalo (which can weigh over a ton), and various species of shark. It can go for months without eating anything at all. It is generally very lazy and spends most of its time sunbathing and sleeping, but is easily galvanised into action if intruders blunder into its territory. Venom: see Great White Shark. 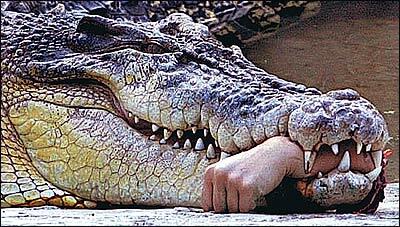 Bite: crocodiles attack with extraordinary speed and their bites carry enormous pressures of up to 5000 pounds per square inch. 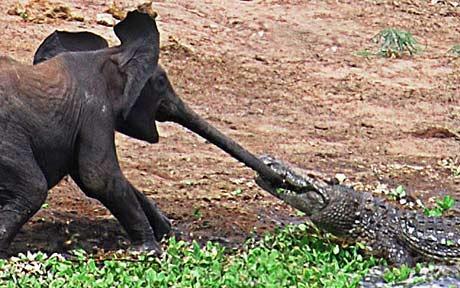 A large crocodile’s bite can easily crush a water buffalo’s skull, so something as puny as a human really doesn’t stand a chance. After trapping prey between their jaws, crocodiles perform a “death roll” to throw it off balance and drag it into the water, where it either drowns or dies from its injuries (or both). They then tear their victim into bitesized pieces by shaking it violently from side to side. Clinical features: bites and “death roll” trauma result in deep and often catastrophic lacerations to skin and underlying structures. Limbs and other body pieces may be missing: these can usually be found scattered around the area of the attack or in the crocodile’s stomach. 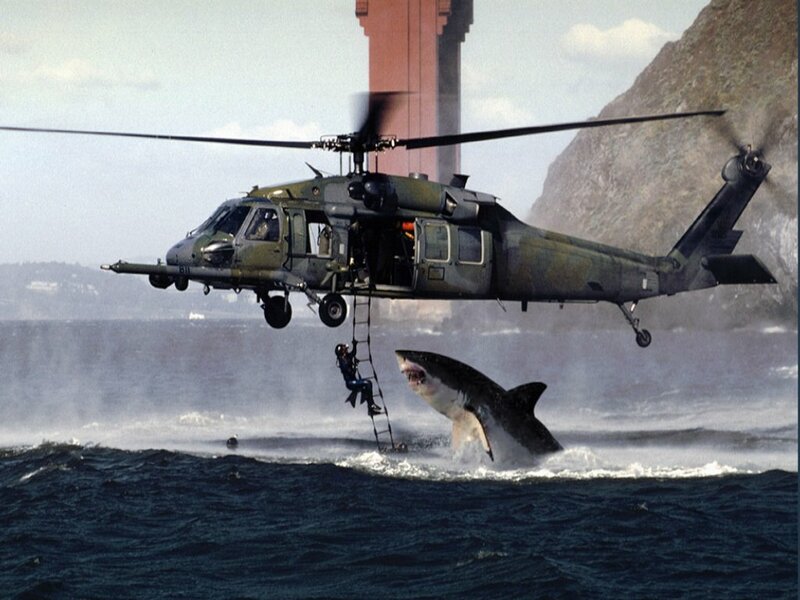 Management: as for shark attacks. Specialist limb reattachment services may be required. Wound infections with Pseudomonas and Clostridia are a major problem, and can progress to osteomyelitis (which may necessitate amputation) and severe sepsis. Crocodile attacks kill one or two people every year in Australia and leave several more with horrific and debilitating injuries. Australia is very proactive about preventing and treating animal incidents on its beaches. Most beaches have safety nets to keep out most of the nasties and are closed if there are risks to the public. Lifeguards and first-aiders are fully trained in recognising and treating stings, bites and other injuries – and most of the locals will probably know what to do too! And of course, antivenoms are available for the three most deadly sea creatures: stonefish, box jellyfish and sea snakes. If you’re really desperately worried about these animals, they’re pretty easy to avoid: just don’t go in the water! Research into the venoms of marine animals doesn’t just help to protect humans from dying if they are envenomed. The fact that the venoms often act very quickly to elicit very specific effects on various body systems is also guiding the development of new and better drugs for a whole variety of conditions. For example, the cardiotoxic effects of box jellyfish venom may actually be used to treat heart problems in the future. Experiments with various deadly neurotoxins have found that they can be effective in the treatment of epilepsy, Parkinson’s disease, dementia and pain. Ziconotide, an antinociceptive analgesic derived from cone snail venom, was introduced in 2004 for the treatment of severe chronic pain. It is up to 1000 times more powerful than morphine, and is non-addictive. So, these animals may actually help humans in the future! Of course, no epic foray into the dangers of Australian wildlife would be complete without a bit of Steve Irwin – what an absolute legend that man was 🙂 I get a tear in my eye whenever I watch that second video! You need to create a blog about 2012 and if the globe will finish, I adore to listen to people’s unique perspectives on this There’s insane things occurring inside the globe ideal now so who knows if 2012 is the finish.